We all know limiting screen time during summer is a challenge. If you work from home, and need your kids to stay occupied and out of trouble without destroying your house, it’s even more of a challenge. I created a Boredom Busters list a few years ago that I still post every summer. Click Boredom Busters to open the printable file. This year we added a chore app to our arsenal. Chorma. It allows you to assign points to chores linked to a reward system. I chose a $20 gift card (their choice) if they reach 85 points. Chorma worked like a charm the first week and though the novelty has worn off, my kids are still working toward that gift card. I’m nagging less than usual, so it’s working. I think I’ll add extra points to ensure they clean up after any boredom buster activities. 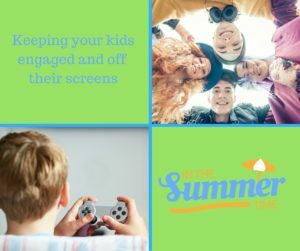 I’d love to hear your ideas for a screen free summer. Good luck and Happy Summer! < Previous Is your family prepared for an emergency?